If you have a pup with a sensitive tummy, have we got a treat for you! 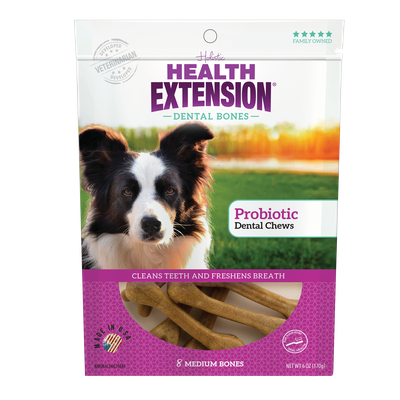 Our Probiotic Dental Bones are made with real yogurt that’s loaded with prebiotic and probiotic ingredients for digestive health. Plus, these super-tasty bones are packed with antioxidants, vitamins, minerals and essential amino acids like all Health Extension pet foods and treats. With natural prebiotics and probiotics! Potato flour, rice flour, vegetable glycerin, potato starch, natural flavor, dried kelp, canola oil, parsley, lecithin, glycerol, flaxseed oil, nonfat dry milk, lactic acid, citric acid(preservative), fructooligosaccharide, rosemary extract, dried bacillus coagulans fermentation product.